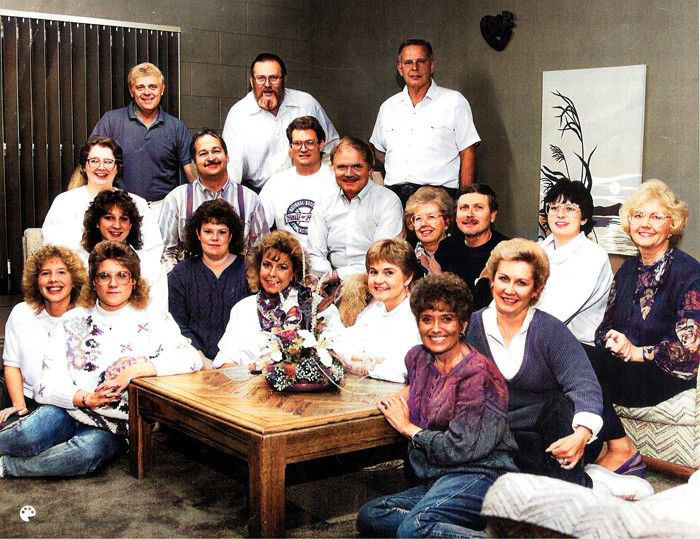 This photo of the Villageaires was taken in the late1980's. Front row left to right is Kathy Dirksen, Jennifer Jones, Patsy May, Joan Jochums, Barb Meyer, Sally Seggerman. Second row left is Amy Gaspardo, Lynn Barth Manning, Jim Meyer, Ann Dirksen, John Podamski, Kelly Christ Seggerman, Jari Lynn Oncken. Third row left is Shelly Butler, Russ McCulley, Jay Hartzler. Back row left is Jack Jochums, Ron Redenius, Ron Dirksen.